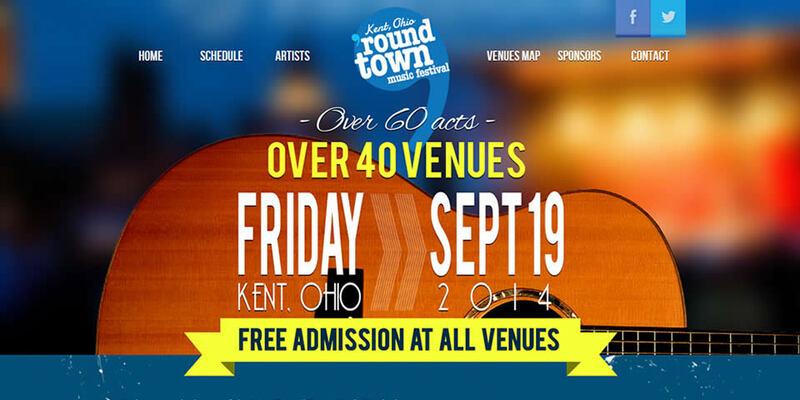 With 60+ artists at more than 40 venues, Kent 'Round Town is Kent's premier music festival. The Crooked River Arts Council has added yet another music festival to its growing portfolio of events in Northeast Ohio. The group responsible for the Kent Blues Festival, The Reggae Meltdown and Beatlefest recently inherited the famous Kent Folk Festival, and have now relaunched it as Kent ‘Round Town. CRAC has worked with us for a number of years on a variety of Websites, and we were thrilled to take on their latest project. With the festival date being moved up by two months from the previous year, we had less than a month to deliver the right style and the tools they needed to administer their new site effectively.